David Janssen had a dependable companion and a discreet keeper of secrets on the set with him the last 14 years of his life. It had a Ford engine. On THE FUGITIVE, several days of each filmed episode were done on location and its hard-working star had been for several seasons without a comfortable place to go between shots. At the Goldwyn studios he had a permanent dressing room in the Writers' Building. But off the studio lot, he'd been using a very small room in what is called a 'honeywagon'--a mobile unit not known for its spaciousness. Quinn Martin and his producer team decided to remedy this to keep their star happy and thus protect their show. In October 1965 Janssen was more than half way through season three when he arrived at a sugar factory in the Orange County town of Santa Ana to shoot part of the "Not With A Whimper" episode. The 30-foot motor home was presented to him with a surprise accessory inside. The producers had arranged for Suzanne Pleshette (photo) to be waiting inside the trailer --- in a bow. She'd recently completed a Fugitive episode and was romantically linked to Janssen. It was manufactured by the now-defunct Streamline Trailer Company, a small manufacturer based in El Monte, CA. These motor homes were in production from about 1964 to 1967 when it became a division of Newell. Some models had a caboose-like rear deck; Janssen's did not. A total of only about 80 were made. The late jockey Willie Shoemaker had one. So did actress Anne Baxter who also used it for location shooting. Hers now belongs to an ex-football player in the California desert and has been lovingly restored. Janssen's had the serial number 5028, indicating it might have been the 28th in the production history. His 1965 Travel Home established itself as a members-only social hub of the FUGITIVE set. David was known to invite people in and entertain. The shower was converted to storage for booze. Janssen's Fugitive Teamster/driver Bud White (photo) was first to care for the motorhome and acted as bouncer/bartender/mechanic. When the series wrapped up the bus stayed in Janssen's possession and White stayed with the actor for many years. A falling out occurred before the start of the HARRY O series and a new driver, Elliott Shapiro took his place in 1974. Elliott was Janssen's contractual driver for the remainder of his career, locking it up at the Agoura, California FATHER DAMIEN filming location before driving Janssen home to Malibu in a production car after work on February 12,1980. Janssen would never set foot in the vehicle again. He died that evening. 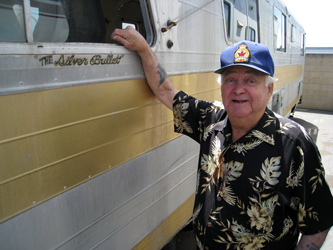 In May 1980, the estate of David Janssen sold the bus for $2500 to Alan C. "Pete" Wilson, an old Fort Ord Army buddy and long time friend of Janssen who was in the horse trade. He soon sold it to someone at the Del Mar racetrack who used it for storage there. Driver Shapiro ferried the bus to the new owner. Later it passed through several hands. A man from Pittsburgh bought it, came to California to get it, drove it 100 miles, then died suddenly. His sister and her husband (Claire and Jerry Harvey) from El Cajon, CA acquired it and kept it a few months. Claire sold it to her niece and niece's husband (James Johnson). They kept it for over a year, replaced the original fronts seats, used it on trips. James sold it to a Santee, CA man named Steve Spivey. He unfortunately cannibalized some of the interior and used the bus for storage of auto parts for his automotive business. We learned though Janssen fan "Texas Bob" Reinhardt that Spivey had sold it. An interested buyer named Randy Vaughn considered getting the vehicle in 1992 when Spivey placed a newspaper ad listing it for sale. Vaughn went to see it, taking the photo at right, and decided to pass - as decision he would later regret. 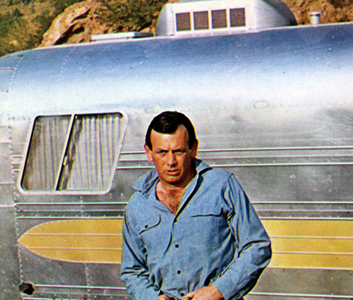 When The David Janssen Archive learned of this, we took on as a project to locate the bus. Was it rusting away somewhere? Had it been sold for scrap? We reached Spivey but he was of little help. All he recalled was that it was purchased in a cash deal to a retiring Marine who was taking it to Fallbrook, CA. He had no name or no paperwork. The trail was cold. And remained so for over 15 years. 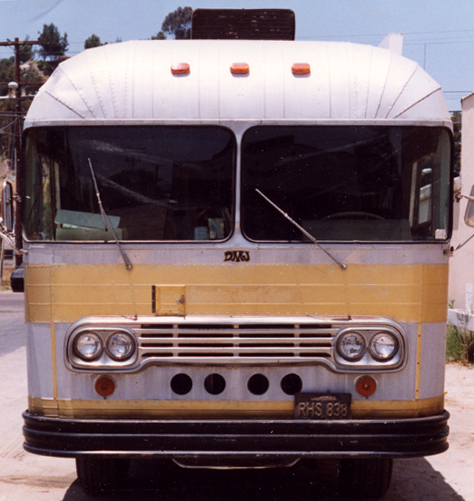 The bus had a unique look with its boxy Airstream-like aluminum shell, and with gold annodized banding on the front and sides. 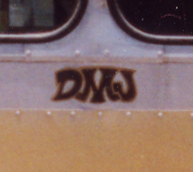 The 'distinguishing marks' on Janssen's model were the customized intitials "DMJ" (for David Meyer Janssen) painted under the divided front windshield , and its "The Silver Bullet" nickname painted under both passenger windows. "Please knock" was painted on the door itself. "Welcome to the Janssen social club. Please knock and wipe your feet. Thank you." and "If you don't like to party, don't ring the bell" . Was the current owner aware of the vehicle's celebrity-linked past and the show business secrets locked inside? Known was the erroneous VIN number (3474R1OKC - actually the Ford engine number which was riveted to the coach) and the 60's original black and yellow licence plates (RHS 838) that originally which were still intact when Randy Vaughn saw it in 1992. An attempt to gain information from the California DMV with that information proved futile. Neither number was still in their system. Earlier, before public information had become so carefully protected, a California policeman ran the plate number for another Janssen fan. It linked to a Peter A. Talley and a registration address in National City, CA. The address belonged to the Pepper Oil Company, but no one there had heard of Talley or remembered the bus! Years passed without a clue. We'd try occassionally to pester last-known owner Spivey and try to jump start his memory, or find a "Peter A. Talley" who didn't seem to exist. This was proving more elusive than the search for the one-armed man! This website was started in 2003 and this page was originally constructed to be a request for help in finding the vehicle. As it was last known to be in the Fallbrook, CA area, the website prevailed upon a staff writer for a local paper, the North County Times, to write an article about the search for the bus. That article was published in December of 2005. Disappointingly there were no resultant leads. But a breakthrough did come in the summer of 2008. It came quickly and without warning. The internet played a big part in the surfacing of the bus, but it was the good nature of people, 1 in particular, who rescued this bus from its further demise. We'd known about a Tom Patterson, a Houston-based enthusiast for the short-lived company that produced the coach. He had started an online Streamline registry identifying about half of the owners of all the Streamline travel homes that were manufactured. Janssen's was one of the many not accounted for. We asked Tom to keep an eye open. The website was contacted in May 2008 by a Mr. Eddie Huffstetter, Tom Patterson's friend in Houston and an owner of 2 Streamlines himself. Intrigued with our quest and aware of our many dead end attempts to find the Streamline, he said simply and with confidence, "I have one goal and that is to help you find this coach". How could this stranger do what hours of dedicated commitment by us failed to do? The world was working in mysterious ways. In early July, an entrepreneurial San Diego man who ran an Ebay selling business called "found1onearth" was driving in Solana Beach, California. Something glistening in the driveway of a modest hilltop home caught his eye. The sun was hitting the aluminum shell of what he thought was a trailer just right and it grabbed his attention. "Found1onearth" was always looking to find something of value that the owners didn't realize they had that he could acquire cheap and turn a profit on. He went on the property, took a closer look, and saw the "please knock" painted on the bus door. Surmising this was owned at one time by someone important, he decided to go to the house door to inquire further. That inquiry lead him within a few days to Donald Icenhour, a retired Marine master sergeant who no longer lived on the property. The bus was his, but house belonged to his mother-in-law and brother-in-law. The presence of a rusting non-operational vehicle at the house was the source of a family feud. Donald knew nothing of the actor lineage of the bus, only that it was a rare vehicle and must have been owned by someone "rich". "Found1onearth" worked out a deal with quite advantageous terms --he could have the bus for free if he'd remove it from the property, a cost he'd attempt to pass on to the buyer. On July 27, 2008 he ran a Ebay ad and the lightning speed of the internet worked its magic. Originally titled "RARE - ONE OF A KIND - 1965 STREAMLINE 32 FT MOTORHOME", it was literally hours later that the speculative seller learned what he had. A woman in the San Francisco area actively searched old trailers and motorhomes on Ebay. When she saw the photo on the listing that detailed the painted "the Silver Bullet" under the window, she recalled this webpage, and provided the seller with the Janssen connection and our web address. "Found1onearth" immediately upped his reserve price and changed his listing believing he now had a motivated buyer who would pay more than he'd ever anticipated. There was one problem. We were on vacation and not getting e-mail. And "found1onearth" made one costly mistake. When he retitled the listing, it was as "1965 STREAMLINE DAVID JANNSEN" with Janssen spelled incorrectly. Therefore it went unnoticed to anyone interested in the actor, and remained searchable just to the motorhome enthusiasts. This new-found information which potentially did raise buyer interest was lost to a spelling error. On this same day, our advocate Eddie Huffstetter's search engines too revealed the Streamline for sale. True to his word he went to work. He acquired the bus on paper at a very modest price, outlaying his own cash, and ending the auction early. He then turned the bus over to us asking only that his out-of-pocket expenses be reimbursed. His unwavering dedication to completing this very time-consuming task and the generous spirit with which he facilitated all aspects of the transaction will never be forgotten. 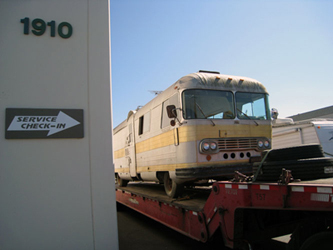 On August 8, 2008, The David Janssen Archive took possession of the Silver Bullet and it was towed 160 miles to a repair facility to begin its journey back to life. Ironically, the Solana Beach house where it sat for 15 years overlooks the Del Mar racetrack track where it had been brought in 1980 by driver Elliott Shapiro soon after Janssen's death. In a sweet reunion 3 days later, Elliott stood next to the bus for the 1st time in 28 years (and will be invited to be the 1st to drive it when it is roadworthy). The engine has been successfully started up, but the brakes need some work. In fact the bus needs a huge amount of work. see a short clip of the Silver Bullet in action in 1974 -may it hit the road again! !